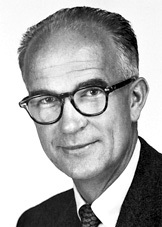 William Shockley was an American physicist who shared, with John Bardeen and Walter Brattain, the 1956 Nobel Prize in Physics for their joint development of the transistor. During World War II, Shockley worked on anti-submarine research for the US Navy. In 1947 he and his colleagues, Bardeen and Brattain, invented a point-contact transistor and a junction transistor at the Bell Telephone Laboratories. As professor of electrical engineering at Stanford University (1958–75), he caused controversy with his views on the link between race and intelligence.